The Spector Bass Legend 5 Classic Bass, Slate Grey provides players with a powerful 5-string bass, iconic NS body-style, and a captivating figured maple top, creating a truly stunning aesthetic and extended tonal range. The maple body is coupled with a smooth playing maple neck and rosewood fingerboard, offering players a comfortable playing feel and beautifully bright tones. A set of custom SSD INC humbuckers are designed to bring out every nuance of your performance, built with ceramic magnets and steel pole pieces to produce warm characteristics with plenty of output. Finishing touches include Spector's TonePump preamp for excellent tone shaping, and their locking die-cast bridge to enhance string stability and sustain. The Legend Classic design draws on that symbol of Spector heritage – the coveted NS. With its classic body shape, the Spector Legend provides a smooth and comfortable performance that is a pleasure to play, with a double cutaway for easier access to the higher frets. 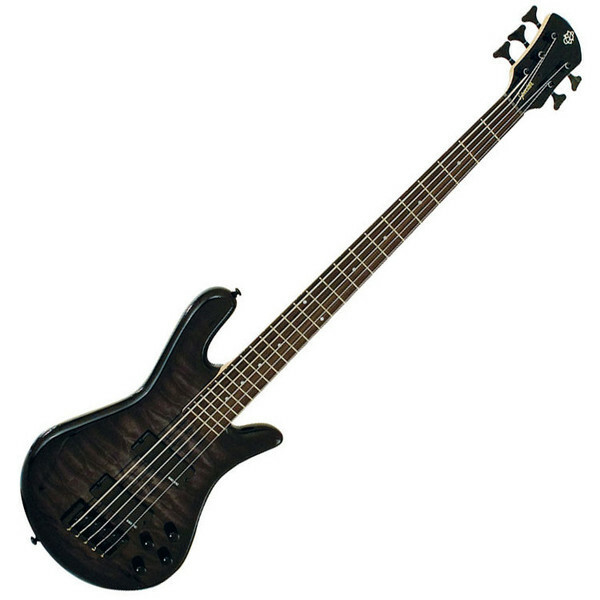 Additional classic Spector appointments include four standard black control knobs, Spector headstock and black pickups. Along with its iconic shape, the Spector Legend Classic is crafted from a bright sounding maple body topped with stunning figured maple, creating a truly captivating looks with a tone to match. Coupled with the stylish body is a maple neck and rosewood fingerboard, providing an incredibly bright tone with plenty of sweet characteristics and sustain. The addition of the rosewood fingerboard helps 'fur up' the maple's harsh edges, delivering a beautifully thick low end, with a focused midrange and sizzling highs. The SSD INC Humbuckers are uniquely designed for Spector Basses, ensuring players can get the most out of their performance. With its passive design, the two humbuckers produce very little noise but plenty of output, featuring ceramic bar magnets and steel pole pieces for a warm, sweet tone. Both bridge and neck humbuckers offer a smooth pick attack and plenty of midrange boost, while the neck offers more bass for chugging rhythm sections and the bridge is ideal for sweet licks. The Spector TonePump Active Bass and Treble controls are provided by means of 2 continuously variable knobs, deliver quick tonal changes for a variety of different soundscapes. By dialling up bass and treble knobs, the Spector TonePump will provide 12 dB boost in both the Bass and Treble range. The TonePump is a 9v DC circuit and is Spector's most aggressive preamp on the market.